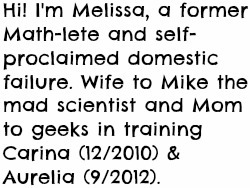 I wish my sponsor, Surviving Infancy, had existed when Carina was born. I remember leaving the hospital feeling like I had no idea what to do should an emergency arise with this new little person for whom I was completely responsible. We've been lucky in that neither of our girls have had too many issues...save for a few that I think I resorted to asking for your help because I didn't know how to handle them! Developed by top physicians Dr. Maureen McCollough and Dr. Diane Birnbaumer, Surviving Infancy™ is a 3-hour 15-minute video guide that presents 36 essential topics covering infant and toddler safety, routine illnesses, common parenting challenges, immunizations and pediatric emergencies including choking first aid and CPR hands-on demonstrations. It was created to help new and expectant parents, grandparents-to-be and child caregivers navigate the often difficult aspects of infancy through the toddler years (0-3 years). Surviving Infancy™ is thought to be the most comprehensive video guide of its kind with unparalleled and authoritative content. Upon much research, we found that there was definitely a lack of authoritative and concise educational DVDs available to new parents on the care of their new child which is astonishing since one would think that the health and safety of one’s new baby would be of utmost importance. With our company background in providing live and internet-based continuing education courses for medical professionals, it was clear that we had the resources and award-winning medical educators to create the video guide we searched long and hard for but never found. After over a year in development by top physicians, Surviving Infancy was born. 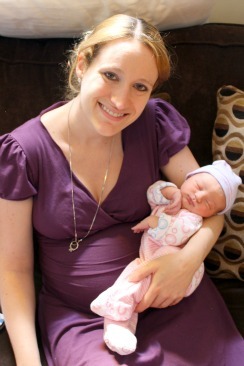 What topic covered in Surviving Infancy do you think is the most important "must-see" for new parents? Parents and caregivers should know them all if looking after any child, but if we had to choose one topic all parent’s should be familiar with, it would be fever, because it is one of the most common symptoms managed by pediatricians and other health care providers and frequently results in unscheduled doctor visits, calls for medical advice and extensive use of over-the-counter fever-reducing medications such as ibuprofen or acetaminophen. Carina enjoys watching it, too. She'll bring it to me and say, "watch babies!" 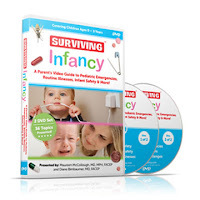 You can purchase Surviving Infancy™ as a 2 DVD set, or as a streaming video. Get 20% off with promo code GEEKY20! 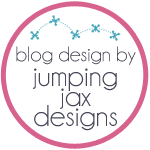 2 of my readers (yay, 2 winners!) will win a copy of the Surviving Infancy™ 2 DVD set! This is a Rafflecopter giveaway. Click "Read More" below and then follow the instructions on the widget. Make sure to click "Enter!" after you complete each entry. All currents count! The giveaway is open worldwide and ends at 11:59 PM EST on Tuesday, January 15th. The first entry is mandatory - Visit Surviving Infancy's website and tell me what topic most interests you (they're at the bottom of the homepage). Once you complete this entry, the widget will give you the option of completing the rest. Complete more steps for more chances to win!